The summer of ’91 started with journalists commenting on the tenth anniversary of the ’81 riots. The Meteorological Office predicted a long hot summer, and political pundits predicted more of the same. However, the most important indications of police community relations are how the police behave on the ground. The policing of Hackney over the summer months has been heavy. The police have reverted to the “fire brigade” style of policing which was widely condemned in the early eighties. Some incidents have hit the headlines, like the July 4th raid on the Pembury Estate, which involved 85 officers who made 13 arrests. Other incidents have passed by virtually unnoticed. In the four months, April — July 1991, 38 cases were reported to HCDA, arising out of 14 separate incidents. In nine of these incidents, 10 police officers or more were involved in making arrests. Needless to say, the Territorial Support Group (TSG/riot police) have played their usual central part in policing the borough. The police claim that the reason for such heavy handedness is that officers are getting injured and have to operate in large numbers for their own safety. But, this does not justify the attendance of over 30 officers to make one arrest. Instead of sending in the shock troops every time a call goes out for assistance, perhaps the police can put their heads together to think out a strategy for dealing with crime in Hackney. Police harassment – and intimidation are making many People angry, and it is only a matter of time before serious disorder breaks out. However, it is crucial that there is a measured response from within the community. Off the cuff remarks by community representatives, such as Lloyd King’s comment that the Pembury raid was the police’s revenge for the shooting of PC Laurence Brown, do not get us anywhere. They only provide the police with ammunition to cover up their actions. 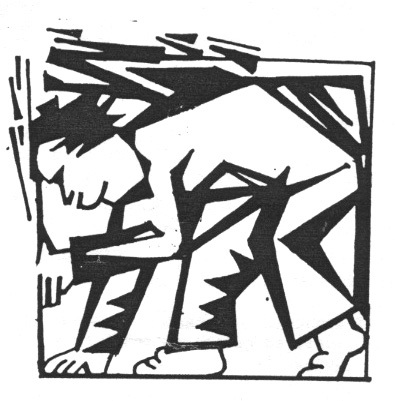 When the police attack our community, they single out particular individuals for arrest. This serves to divide the community. It isolates the people who have been arrested, and those who have not been arrested are relieved that they have not been picked on. The first line of defence following a police attack has to be to support those people who have been unjustly treated. That means making sure that people get good legal advice and do not go into the first solicitor’s office they see in the High Street. The next step is to ensure that people who see the incident come forward to act as witnesses. This can be easier said than done. Witnesses have to be traced as soon as practically possible. A week later may be too late, they will have forgotten much of what happened and might feel reluctant to come forward because of fear of police recriminations. By calling on witnesses to come forward in support of defendants we are achieving much more than just supporting a person’s legal defence. We make individual arrests into community issues which unite rather than divide our community. By taking up individual cases of police injustice in a practical way, we are also able to build up a general picture of policing. HCDA is able to assert that fire brigade policing is the norm in Hackney on the basis of several hundred reported cases in the past two years. On numerous occasions in the past we have called for a public inquiry into policing, to no avail. If there is not going to be an official public inquiry, then the community has to get its act together to compile its own reports into policing. This can easily be done by talking to people about their experiences and documenting all the evidence. If our community is unable to defend one person who has been unjustly treated by the police, how can we expect to defend ourselves in a serious confrontation? Building community resistance takes place everyday in response to all incidents of police harassment, no matter how minor. Riots, on the other hand, erupt as a spontaneous response to extreme police provocation. They are a last resort. Disorganised rioting enables the police to suppress all resistance and create distrust within the community. Sandwiched in between is a night or two of euphoria for a community which gives the police as good as it gets. HCDA intends to work to avoid the above situation developing. If rioting does break out, it is our duty to ensure that our community stands together and defends itself. All is not well at City Road police station, even by the poor standards of the Metropolitan Police. Much publicity has focused on the station in the past year. On August 28th 1990, PC Laurence Brown was killed. A few months later, in December, seven officers were sacked for beating up Gary Stretch in 1987. HCDA believes that there is a management crisis at the station. The death of a colleague is a bitter blow in any workplace, especially if that person is killed at work. For police officers, with their strong collective identity, death is even harder to accept. But, they are in a position to do something about it, they can take their grief out on the community they police. The seven police officers who beat up Gary Stretch in November 1987 were suspended from duty for three years. They did not expect to be found guilty of discreditable conduct at an internal disciplinary tribunal in October 1990. It is likely that their colleagues shared their optimism. During the disciplinary hearing the seven men received a great deal of support from their colleagues. The Police Federation hired QCs to represent them. They attended the tribunal in a police carrier which was at their disposal for every day of the hearing; a valuable police resource taken out of normal policing duties for several weeks. Chief Superintendent Nial Mulvihill, then in charge of City Road, spoke out in favour of the men. He must have known that the seriousness of the case meant that the officers were likely to be sacked. But, in order to retain the respect of the ranks he had to support them, even if in doing so it did nothing to improve his own standing in the police. Then the bombshell. On October 30th they were found guilty and recommended for dismissal. They were officially sacked on December 7th, and all seven are now appealing against the decision. The power of police constables is invested in their authority to make arrests. They can also use their own discretion when making an arrest. They can, more or less, pick and choose who to arrest and who not to arrest. Given the individual powers of constables, their collective strength is immense. In effect, police management can only operate with junior officers consenting to accept the orders of their superiors. If something happens which causes the management structure to break down, where the ranks feel they are not getting the support of their superiors, senior officers have to tread very carefully in order to get their co—operation. HCDA believes that such a break down has taken place at City Road. Within months of an officer being shot dead on duty, seven colleagues were sacked for beating up somebody. Furthermore, in the eyes of City Road police, the decision to sack the men was made by people who do not know anything about policing the streets, and came about as a result of political pressure. Coming so soon after the shooting of Laurence Brown, it was just like rubbing salt into the wound. As a result, City Road officers are asserting their collective will against senior officers by going out on the streets and doing as they please. They are doing this safe in the knowledge that their superiors do not want a confrontation with all the officers at the station. HCDA’s evidence for the crisis lies in the number of reported incidents involving City Road officers in 1991. City Road police were involved, alongside the TSG, in the 19 arrests at Chats Palace on March 22nd. City Road Serious Crimes Squad conducted the raid on the Pembury Estate, with the TSG acting as back up, on July 4th. City Road police, again with TSG officers, decended on Hoxton when Jimmy Jennings tragically died on July 21st. In addition, HCDA has received many reports of intimidation and harassment by City Road officers. In May, about 15 City Road police officers raided a house in Dalston for firearms. The front door was sledgehammered in, despite the fact that the occupants were just about to open it, floorboards were ripped up and a partitioning wall smashed. Some of the officers were carrying spiked truncheons. No firearms were found in the house and the five occupants were keen to find out why they were raided. When they went to City Road station to get a copy of the search record, which is their right, they were told that no record had been made. To date, they have not received a copy of the search record. A man, who was cabbing in the City Road area, was stopped by police three times in one week, before deciding to give up his job because of the harassment. A black youth who was arrested by City Road officers, and held in custody for several hours before being released without charge, has given up his college course as a result of his bad experience. This list does not include the many people HCDA has spoken to concerning regular stop and searches on the streets. Some people have said they have been stopped on an average of once a week over a six month period. The Metropolitan Police have repeatedly claimed that they are overcoming their bad reputation in the community. The Gary Stretch case was held up as an example of how they are ridding themselves of the “rotten apples”. HCDA asserts otherwise. Unless the powers of the police are restricted by law, and our community has real control over individual police officers actions, they will continue to abuse their powers. Area Two Territorial Support Group is based at Bow Road police station. They drive around in reinforced Sherpa carriers and can be identified by the flat caps and three quarter length protective jackets they wear, and an E prefix to their lapel numbers (if they are wearing them). 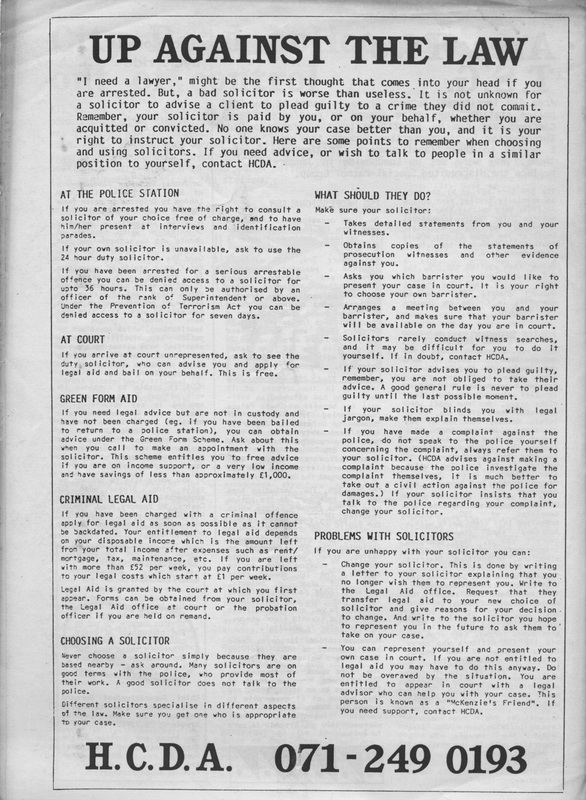 They were set up London-wide in January 1987 to replace the discredited Special Patrol Group. The SPG were set up by the Met as specially trained riot police in 1965. Very quickly they gained notoriety for their viciousness. Following the death of Blair Peach at the hands of the SPG in Southall, demands for their disbandment grew. Rather than abolish the SPG, the Met reorganised and renamed its riot police as Territorial Support Groups. TSGs commenced operating in London on January 12th 1987. Until September 1985 the Metropolitan Police were organised on a district basis. There were 24 districts and Hackney borough was G District. In 1985 they reorganised into eight areas, and the areas were subdivided into divisions, 75 in total. Hackney consists of two divisions – Hackney, which also covers City Road (denoted by the letters GH), and Stoke Newington (denoted by the letters GN). Hackney is in Area Two, which also covers Tower Hamlets, Newham, Barking and Dagenham, and Havering. Before reorganisation, the SPG consisted of 280 officers organised into eight units with a Scotland yard commander in overall charge. They operated independently of the district structure. In addition, District Support Units operated in similar fashion to the SPG, but under the control of district commanders. In total there were about 1,100 police deployed in DSUs. The formation of the TSGs combined SPG and DSU units into area based forces. Each area now has 118 TSG officers who serve for a maximum of four years. 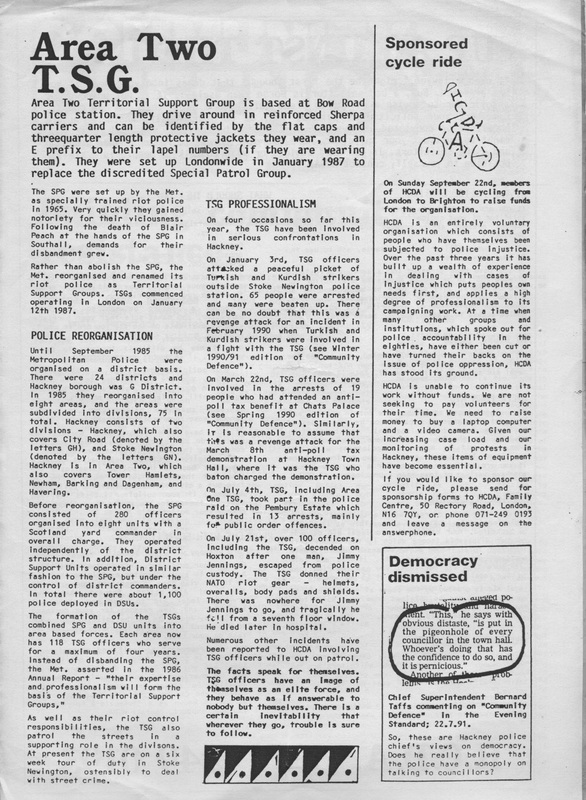 Instead of disbanding the SPG, the Met, asserted in the 1986 Annual Report – “their expertise and professionalism will form the basis of the Territorial Support Groups,” As well as their riot control responsibilities, the TSG also patrol the streets in a supporting role in the divlsons. At present the TSG are on a six week tour of duty in Stoke Newington, ostensibly to deal with street crime. On four occasions so far this year, the TSG have been involved in serious confrontations in Hackney. On January 3rd, TSG officers attacked a peaceful picket of Turkish and Kurdish strikers outside Stoke Newington police station. 65 people were arrested and many were beaten up. There can be no doubt that this was a revenge attack for an incident in February 1990 when Turkish and Kurdish strikers were involved in a fight with the TSG (see Winter 1990/91 edition of “Community Defence”). 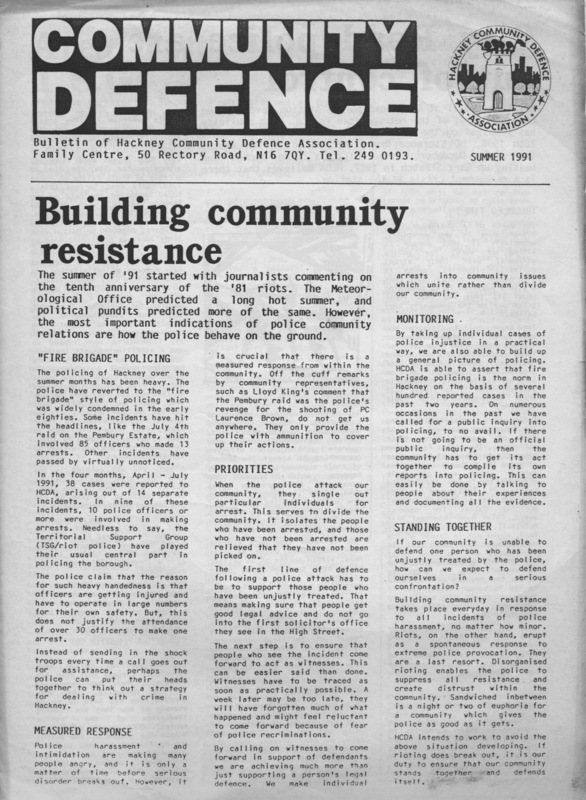 On March 22nd, TSG officers were involved in the arrests of 19 people who had attended an anti-poll tax benefit at Chats Palace (see Spring 1990 edition of “Community Defence”). Similarly, it is reasonable to assume that this was a revenge attack for the March 8th anti-poll tax demonstration at Hackney Town Hall, where it was the TSG who baton charged the demonstration. On July 4th, TSG, including Area One TSG, took part in the police raid on the Pembury Estate which resulted in 13 arrests, mainly for public order offences. On July 21st, over 100 officers, including the TSG, descended on Hoxton after one man, Jimmy Jennings, escaped from police custody. The TSG donned their NATO riot gear – helmets, overalls, body pads and shields. There was nowhere for Jimmy Jennings to go, and tragically he fell from a seventh floor window. He died later in hospital. Numerous other incidents have been reported to HCDA involving TSG officers while out on patrol. The facts speak for themselves. TSG officers have an image of themselves as an elite force, and they behave as if answerable to nobody but themselves. There is a certain inevitability that wherever they go, trouble is sure to follow. On Sunday September 22nd, members of HCDA will be cycling from London to Brighton to raise funds for the organisation. HCDA is an entirely voluntary organisation which consists of people who have themselves been subjected to police injustice. Over the past three years it has built up a wealth of experience in dealing with cases of injustice which puts peoples own needs first, and applies a high degree of professionalism to its campaigning work. At a time when many other groups and institutions, which spoke out for police accountability in the eighties, have either been cut or have turned their backs on the issue of police oppression, HCDA has stood its ground. HCDA is unable to continue its work without funds. We are not seeking to pay volunteers for their time. We need to raise money to buy a laptop computer and a video camera. Given our increasing case load and our monitoring of protests in Hackney, these items of equipment have become essential. If you would like to sponsor our cycle ride, please send for sponsorship forms to HCDA, Family Centre, 50 Rectory Road, London, N16 7QY, or phone 071-249 0193 and leave a message on the answerphone. 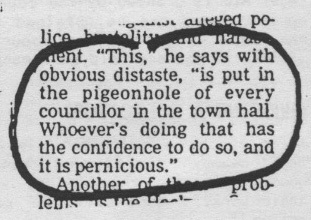 Chief Superintendent Bernard Taffs commenting on “Community Defence” in the Evening Standard; 22.7.91. So, these are Hackney police chief’s views on democracy. Does he really believe that the police have a monopoly on talking to councillors? “I need a lawyer,” might be the first thought that comes into your head if you are arrested. But, a bad solicitor is worse than useless. It is not unknown for a solicitor to advise a client to plead guilty to a crime they did not commit. Remember, your solicitor is paid by you, or on your behalf, whether you are acquitted or convicted. No one knows your case better than you, and it is your right to instruct your solicitor. Here are some points to remember when choosing and using solicitors. If you need advice, or wish to talk to people in a similar position to yourself, contact HCDA. AT THE POLICE STATION WHAT SHOULD THEY DO? If you are arrested you have the right to consult a solicitor of your choice free of charge, and to have him/her present at interviews and identification parades. If your own solicitor is unavailable, ask to use the 24 our duty solicitor. If you have been arrested for a serious arrestable offence you can be denied access to a solicitor for up to 36 hours. This can only oe authorised by an officer of the rank of Superintendent or above. Under the Prevention of Terrorism Act you can be denied access to a solicitor for seven days. If you arrive at court unrepresented, ask to see the duty solicitor, who can advise you and apply for legal aid and bail on your behalf. This is free. If you need legal advice but are not in custody and have not been charged (eg. if you have been bailed to return to a police station), you can obtain advice under the Green Form Scheme. Ask about this when you call to make an appointment with the solicitor. This scheme entitles you to free advice if you are on income support, or a very low income and have savings of less than approximately £1,000. If you have been charged with a criminal offence apply for legal aid as soon as possible as it cannot be backdated. Your entitlement to legal aid depends on your disposable income which is the amount left from your total income after expenses such as rent/mortgage, tax, maintenance, etc. If you are left with more than £52 per week, you pay contributions to your legal costs which start at £1 per week. Legal Aid is granted by the court at which you first appear. Forms can be obtained from your solicitor, the Legal Aid office at court or the probation officer if you are held on remand. Never choose a solicitor simply because they are based nearby — ask around. Many solicitors are on good terms with the police, who provide most of their work. A good solicitor does not talk to the police. Different solicitors specialise in different aspects of tne law. Make sure you get one who is appropriate to your case. Takes detailed statements from you and your witnesses. Obtains copies of the statements of prosecution witnesses and other evidence against you. Asks you which barrister you would like to present your case in court. It is your right to choose your own barrister. Arranges a meeting between you and your barrister, and makes sure that your barrister will be available on the day you are in court. Solicitors rarely conduct witness searches, and it may be difficult for you to do it yourself. If in doubt, contact HCDA. If your solicitor advises you to plead guilty, remember, you are not obliged to take their advice. A good general rule is never to plead guilty until the last possible moment. If your solicitor blinds you with legal jargon, make them explain themselves. If you have made a complaint against the police, do not speak to the police yourself concerning the complaint, always refer them to your solicitor. (HCDA advises against making a complaint because the police investigate the complaint themselves, it is much better to take out a civil action against the police for damages.) If your solicitor insists that you talk to the police regarding your complaint, change your solicitor. Change your solicitor. This is done by writing a letter to your solicitor explaining that you no longer wish them to represent you. Write to the Legal Aid office. Request that they transfer legal aid to your new choice of solicitor and give reasons for your decision to change. And write to the solicitor you hope to represent you in the future to ask them to take on your case. You can represent yourself and present your own case in court. If you are not entitled to legal aid you may have to do this anyway. Do not be overawed by the situation. You are entitled to appear in court with a legal advisor who can help you with your case. This person is known as a “McKenzie’s Friend”. If you need support, contact HCDA. 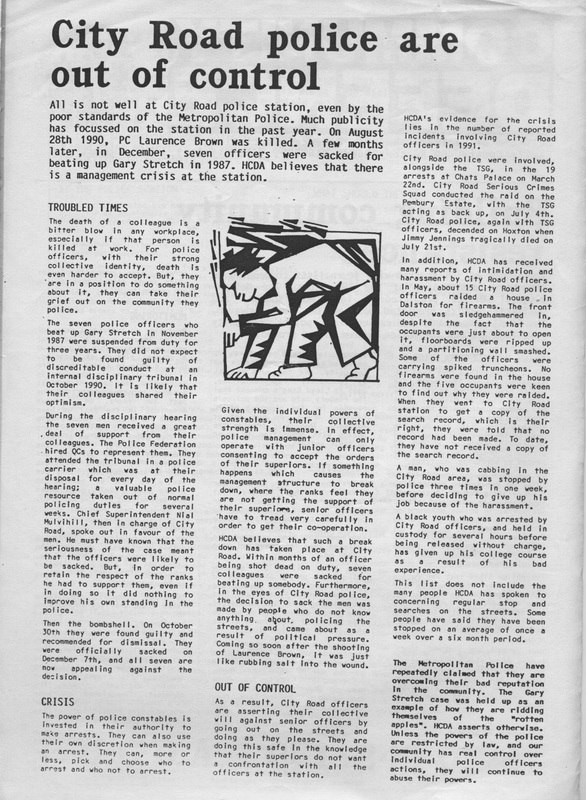 This entry was posted in 1990s, community defence, HCDA, police, poll tax by ackneyinnit. Bookmark the permalink. Stop bad mouthing an honest man who cannot defend himself any longer Gerry Carroll was an honest man.